Stella is 14 years old and finishing her freshman year at Van Nuys High School. She became passionate about playing the violin in 2013, begun studying with Beth Elliot and currently taking lessons with Eric K.M. Clark. 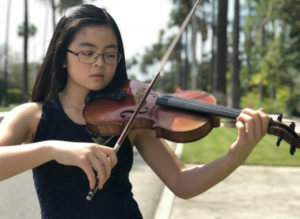 She is able to further her music training by being a member of the Kadima Senior Philharmonic, Kadima Conservatory Philharmonic and the Master Class of Beth Elliot and Eric K.M. Clark. Stella is also in the Advanced Orchestra at VNHS. Aside from playing the violin, her other passion is making music on the piano, ukulele and the flute. Stella cherishes spending time with her family and catching up with her friends. She is an avid reader of many genres. When she needs her downtime, you will find her making brain stimulating projects; building and creating, listening to music, tackling the art of baking and binge-watching her favorite tv shows. She loves theme parks, thrill rides, hiking with her mom and sister and relaxing at the beach. Stella is a proud recipient of The Jeremy & Wendy Phillips award. She is grateful to Kadima in helping foster a love of music.